I have 3 Simpsons super badger brushes. IMHO, they are OK, but I prefer a Thater 2 band any day to the Simpsons. I am curious about the Simpsons Manchurian Duke 3 and Chubby 3. How do they compare to the super badger simpsons and are they worth he very high price? I have a simpson with manchurian badger and while it's a high quality brush, it doesn't do it for me in the face feel department. Recently however I picked up two Thaters.....a funf fan and a 8670 LE in olive wood. While the Funf is a very good brush, I feel the 8670 is just perfect in every way. I found the 8670 to present an ideal combination of softness and backbone due to the shortened loft. amazing on the face....and that barbershop handle is just the best Ive held. Depends on what you are looking for. Density, scrub, backbone, great flow-through (though you need to load ‘em heavy)? Then they’ll serve you well. Mine have very nice face feel, but they aren’t pillow-soft like some other brushes I have. That said, I use a c2m every week, often multiple times. Wonderful brushes. If you are prefer a Thater 2 band, are you using a fan or bulb? Also, can you share the size knot you are lathering with? 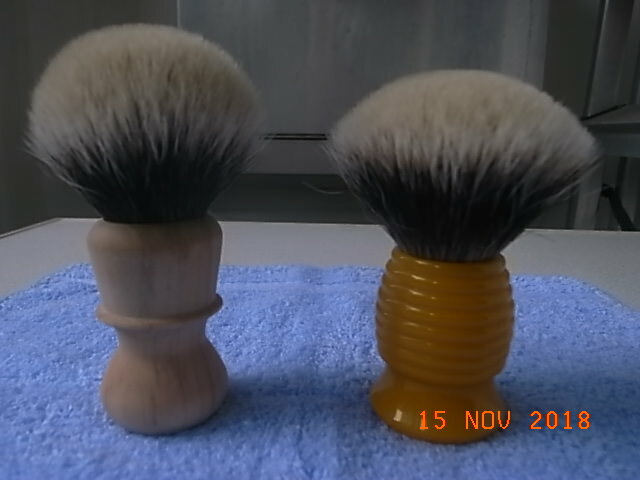 My experience with the Manchurian Simpson knots were on the denser size and also fan shaped, they didn't easily splay for me while face lathering. The flow through was was normally not up to my needs as I prefer softer face feel. It usually felt more compact and direct on the face so I believe that is why many people like many Simpsons model. They offer some soft and consistent knots with ample face feel through backbone. Simpson's Manchurian is a great hair grade - but it is not for everyone. Also face feel will vary significantly with batch, knot size and loft. I tried many and kept just few - all of them with higher than typical loft measure. The ones I kept - a Chubby 2, 58, Jubilee - are great brushes though that I like to use. It's a 54mm loft vs 50mm standard loft. It was not a custom order, but "regular variation". I bought it off BST because of the loft. This also is a relative soft batch. Considering this batch and the loft, it gives you a great scrub with zero scritch. Encouraged by that experience I ordered another from Simpson with a 52mm loft --- and sold it shortly thereafter. I could not stand the face feel. I got really lucky with this tortoise Chubby 2. For me - at least - the perfect Manchurian brush. The Simpsons Jubilee was one of my absolute favorite 2 band brushes. I actually found it to be very balanced and probably one of the better constructed knots I have tried and on par with a Varlet in quality and craftsmanship. If you enjoy the soft feel of a Thäter 2-band, the Simpson Machurian will not be what you look for, especially not at the price Simpson charges for their manchurian. I have owned 12 Simpson Manchurians (Chubby 2's, Chubby 3's and Duke 3's) since 2011, and while they performed nicely, my honest opinion today looking back now is that they are vastly overpriced for what they are. I never managed to find a Simpson handle I really enjoyed, so for that reason I also sold all my Simpson brushes. 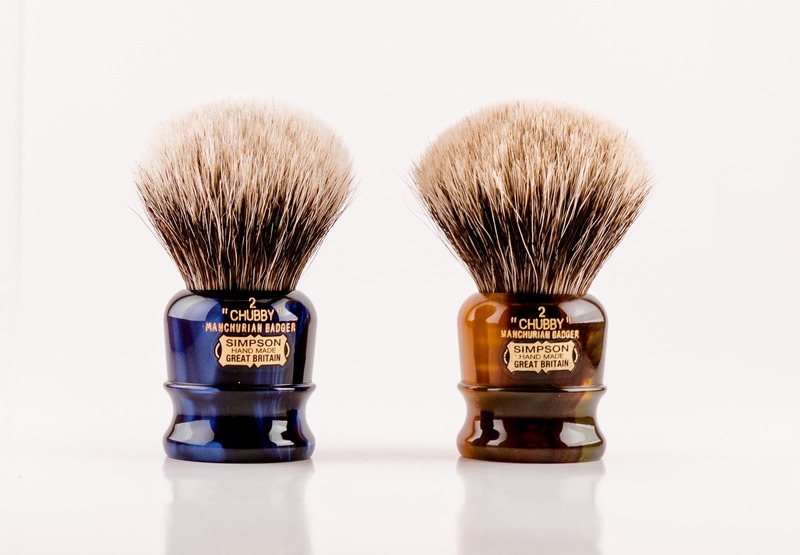 I have nothing against the brand, but for what they are - nice shaving brushes - you see far too many new and semi-old wet shavers raving about this brand in my honest opinion. For your information, I have now settled on 6 Shavemacs (all 2-band and 3-band silvertips 26 mm and 28 mm knots) and 4 Thäters (all 2-bands 41 models with the slightly more robust feel in 26 mm and 28 mm knots), because they for me are the best overall badger brush perfomers among the 100+ high end badger brushes I have owned since 2011. I just measured my tortoise c2m with the calipers, and it’s 53mm (total) loft. It blooms wider than my sapphire, though falls short of German’s. However, the splay is wonderful and makes the brush just heaven to use. Having owned Machurian, Super Badger and a number of Thaters, I fully agree. The challenge in Thaters for me was finding them “too soft.” Shavemac Two band silver tip is a firmer feel, yet sufficiently soft on the face alternative to most Thaters. (11-19-2018, 07:45 PM)MaxP Wrote: Having owned Machurian, Super Badger and a number of Thaters, I fully agree. 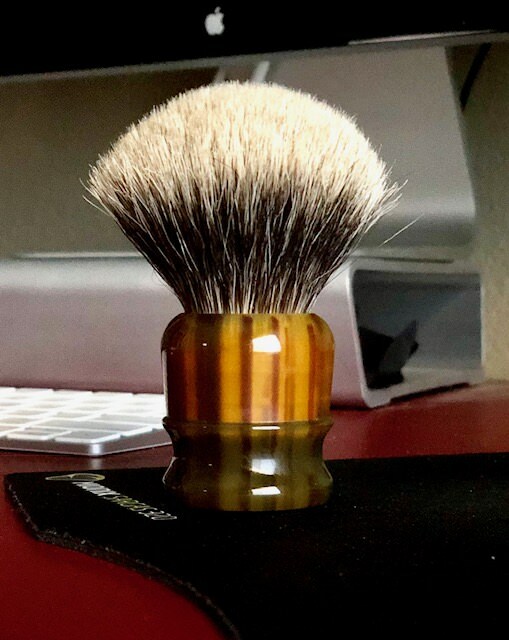 Shavemac's Unique Silvertip 2-Band hair is another step up in backbone as the knot is a denser version of the Silvertip 2-Band. Wonderful knots. 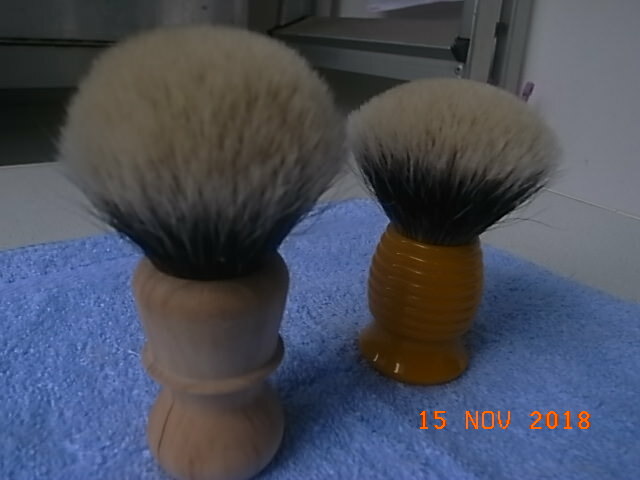 Ditto on the Shavemac 2-band Silvertip knots. They are excellent, and a good alternative to Thaters if you want a little more backbone. 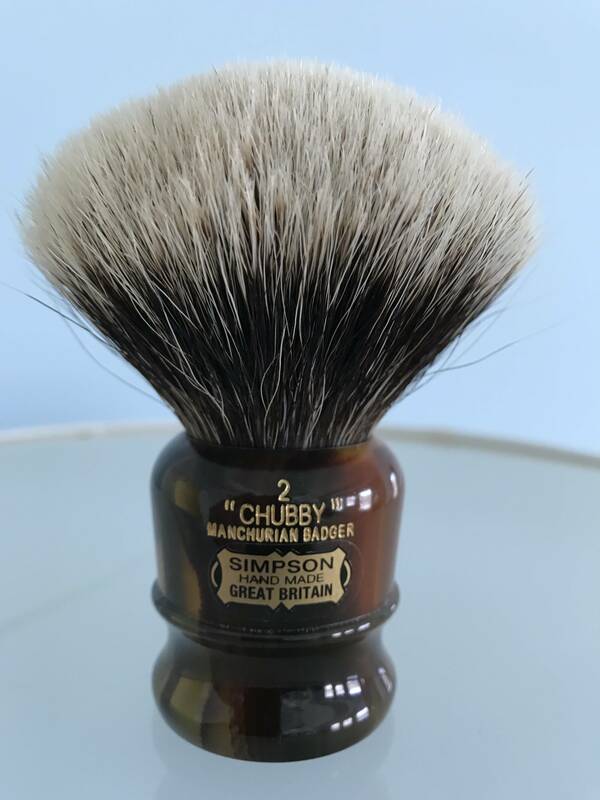 In case you are in the market, there are a few more faux ivory manchurian chubby 2 on Simpson’s website currently. Thanks to everyone for the great feedback. The chubby 3 and 2 Manchurian are very, very, expensive, so I won't be spending that kind of money before Christmas.